Visually, there are Hussars (Russian soldiers, braided brocade uniforms), solitary figures in the snow, a handsome man on horseback, a duel at dawn, and lots of writing desks. The table is laid out. Furnishings, well-appointed. The scene is certainly well-set for the adaptation of Alexander Pushkin's verse novel in iambic tetrameter. What's the conversation? "I cannot, I cannot." The words of le Vicomte de Valmont, on the lips of Evgeny Onegin, to the young Tatyana who asks him-- compromising herself--to return her love. He cannot. The bored young gentleman declines the love of the innocent country girl, then later, after she is married--with wealth and status--he realizes he loves her. Does she still love Onegin? Can he declare himself to her? Will she spurn him? There's a possiblity you don't know, and it's better if you don't. But the drama which hides between the lines of Russia's great poem, spent a good deal of time hiding from filmmaker Martha Fiennes, whose brother Ralph asked her to make this film. The result is somewhat less than the experience of making it, one would guess. Mainly, it seems she was concerned with translating the story to the screen, and letting her brother do the rest. Not a bad idea, considering Ralph's talent, but an unfair delegation in a story like this, which stars a man utterly unresponsive to life--someone who treats getting up in the morning like a sentence to shovel all of Siberia. Why bother? Robert Frost said that poetry is "what gets lost in translation" and the visual tone and style of "Onegin" feels trapped--as frozen as the Neva. The faded buildings, the locales, the dock at misty morning, all were able and well-chosen backgrounds. And many scenes, if viewed as a series of set pieces, are beautiful to look at. The St. Petersburg shots, especially. However, it's too easy to remain disengaged. The film rarely feels alive. We never feel adequately involved. Perhaps it's the kind of trapped you might feel if you were Onegin: at home, but jaded, in the city of St. Petersburg, and aimless in the countryside. But, tragically, the film feels, most of the time, almost as listless as Onegin. Exterior: beautiful; interior: empty. It's as if the director chose only to show what Onegin feels, which is remarkably little. Granted this is a story about a man who is bored with himself, with life, with whatever it is than a man like Lensky, a rustic poet full of aspirations, is reaching for. But the audience should feel more than a lack of emotion for most of the film. If Onegin isn't a fiery anti-hero, then the burden of what pain, and real life, is like might have been shouldered by others in the cast. The slim shoulders of Liv Tyler as Tatyana were not given that opportunity. The script had her express very little in either expression or words, so where was the connection? The contrast? Yes, she looks lovely in lush red, at the ball at her magnificent home, far from her country ways and attire. A pretty present, which Onegin has given away, unopened. Several scenes are memorable for their evocation of the place, period, and--since it doesn't change much--mood. In this area, the film is at its best. However, in terms of emotional gravitas, and in terms of pace and story-telling, it might have been a more moving film. Two moments in the film had a fighting chance. A duel has its form of excitement, and Ralph Fiennes, whose acting is sure and perfectly understated, exchanges words with his opponent at dawn. The aftermath draws the first blood of emotion. In Pushkin's poem, Onegin shoots first, and does not exchange any words prior to the event. Ralph's reluctance to follow the agreed upon screenplay might explain why the script may not breathe quite naturally. 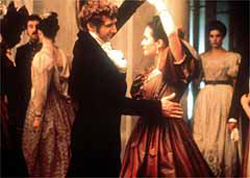 During the making of the film, Ralph said that he felt "caught between my strong instinct not to betray Onegin as I've come to see him and the call of collaboration with Martha, and I feel alternately guilty and determined." The second, for which we must wait, is the moment of truth between Onegin and Tatyana, in private. This setting, and Ralph's acting, could not have been better. The dance, an earlier turning point in the story, is meant to do a lot of things and touch a lot of lives. This scene wasn't nearly so successful, not least since we aren't sure from whose perspective we're experiencing events. Liv Tyler stays very still, and watches from behind columns, and has lovely skin. She can do more than this, at least her performance in Altman's "Cookie's Fortune" suggests it. And she is no match for Fiennes. You have to watch him closely, or you'll miss his actions, his emotions. He plays interior characters so well it's almost taken for granted that he could do this role. He flinches with sincerity, never overdone. Dancing, he's stiff, barely interested, in stark contrast to "The Dance" in The English Patient. 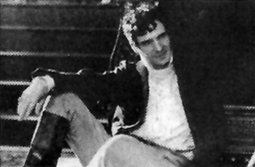 Throughout the film, with two or three exceptions, he is not repressing emotion, but lacking any--even enough to make a show of proper disdain or condescension. He does not need his male acquaintance to BE anything or HAVE any particular traits. This makes him suspect. Intelligent, not scholarly, not even close enough to existential angst to finish the book. But misunderstood. Even to himself. Emotionally economized to near zero, he believes himself to be immune to love. To fire, to heat, to marriage. Without feelings, there are no consequences. And, to be truthful, Tatyana does not interest him, not at first. 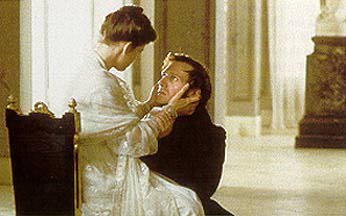 The question of whether Onegin really loves Tatyana after her marriage, or whether she is merely out or reach, and therefore desirable, is never asked in the film. But he is pricked, and he bleeds, of that we are left with no doubt. We do not see Onegin express his love--when a verbal declaration does come, it is instead a declaration of pain. Yet, still, we cannot see into him any more than we can see under the frozen ice of Neva River. Is this a failing of the film? No, Onegin was never meant to be a man understood, or even necessarily liked. The drama and meaning of the story may be elusive. But it's there. You might be able to find it, in spite of the film's shortcomings. 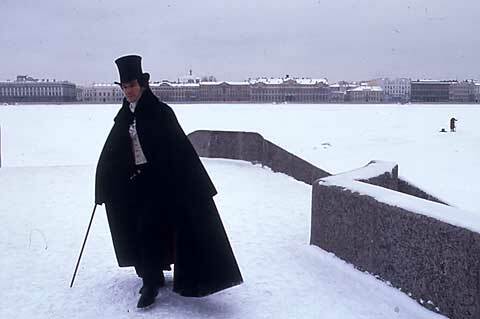 Patience often yields power, and this film had bright beginnings in Pushkin's ageless story. Think of it as a journey. The direct path may not be the most interesting. "Pistols at 20 Paces"--Review by Richard Lamb of the book "Pushkin's Button," by Serena Vitale, New York Times Book Review, March 7, 1999, pg. 27. "Back By Popular Demand"--Review by Donald Fanger of the book "The Undiscovered Chekhov," by Anton Chekhov, New York Times Book Review, March 14, 1999. pg. 12.